We worked with Mortimer St John’s Infant School to help transform their narrow and dark playground space, into a vibrant child-led learning environment full of opportunities for active, creative and imaginative play. To try and inspire children, we transformed the long and narrow area into a fun adventure that started at the door of the classroom. We did this by creating a blue trail on the playground surface that runs from the top of the playground to the bottom which has the appearance of a river. Children can now travel down the long blue trail and self-select from the many new playground additions that they want to play with. 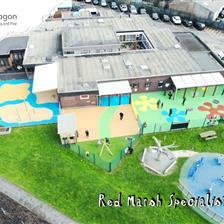 Our Wetpour Safety Surfacing was creatively used to do this and also to help separate zones by colour. 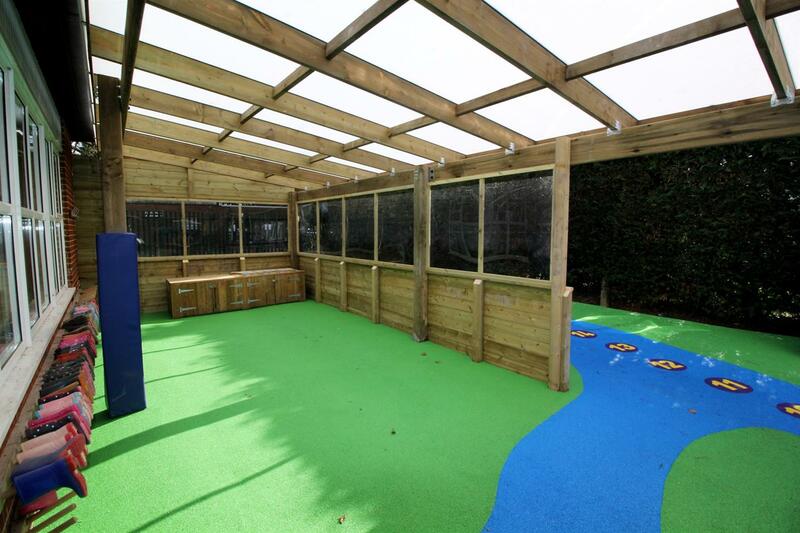 Starting at the classroom, we wanted to make the outdoors feel like a simple extension to the classroom indoors. 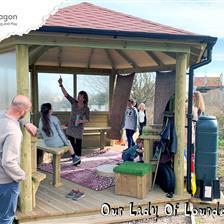 To do this, we connected a fantastic Timber Canopy unique to the school building to keep play and learning free-flowing in all weathers. 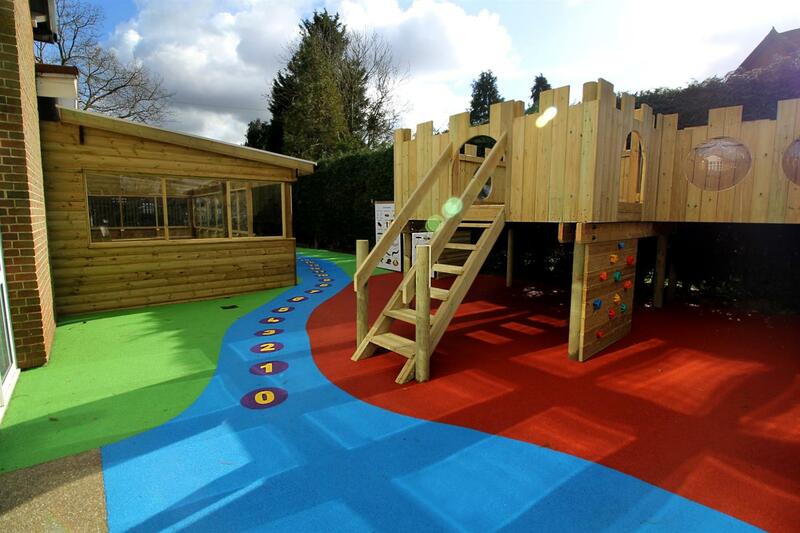 The Wetpour number sequence outside the canopy offers children a sequenced numeracy challenge which they can follow along towards their Langley Play Castle. Along the way, we added our Walk-In Store with Nature Identification Chart Storage Unit which helps keep items and equipment safe. The addition of the identification chart will see children naturally pick up and remember certain creepy crawlies that they could potentially investigate and recognise in the future. Next stop on the trail is Mortimer’s huge Langley Play Castle. 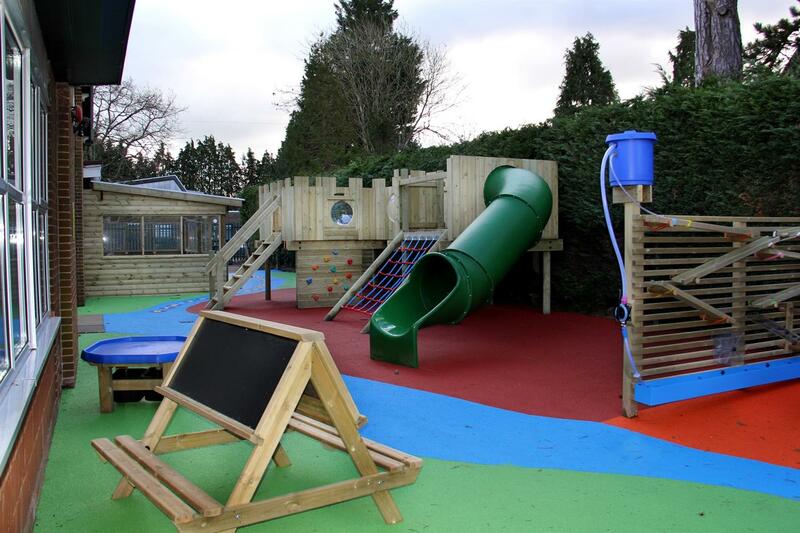 The castle is full of physical challenges that help develop children’s upper and lower body strength, ligament movement and their gross/fine motor skills. It also acts as a great source of inspiration for pretend play as children will imagine they are re-enacting fairy tales and stories with castles. Teaching staff will also be able to use the castle to help introduce children to topics within the curriculum. Subjects within both Geography and History can easily be linked to such a multi-functional resource. For example, teachers could set up a task by creating a treasure map and set clues up around the playground to lead children to the treasure within the Castle. Moving along down Mortimer’s Blue Wetpour trail we reach the middle of the playground where children have two zones to choose from. The red zone focuses on messy and investigative play and the green zone focuses on child-led resources and creativity. Water Wall – one of our proudest deigns which can help teach children about the water flow, source to mouth, gravity and the difference in the mass and weight of materials. Water Table – an inclusive design that is at the ideal height for fluid movements between children… it’s time to find out why things may or may not float? Covered Sand Box – sand play is ideal for both imaginary play and physical development. A must for any early year’s environment. The green creative zone, includes our Tuff Spot Table and Easel Table. Children will be able to decide how they use their Tuff Spot Table. Will it be for drawing, painting or as a desk for materials. Next to it, our Easel Table will be a place for not only creative writing and drawing but also for communication as small groups of children will discuss what they are creating and share their progression. The final zone along the blue trail is focused on Expressive Arts, Communication and Language and PSED. The Half Hex Stage is the centre piece which can not only used for expressive arts and performance in groups, but as a social hub during break and lunch times as well as an aid during lesson times. Get the children to perform and deliver a piece of work they are proud of, similar to ‘Show and Tell’. Music is a great way to express yourself and your feelings which is why we added our Xylophone and Bongo Drums wither side of the stage. It’s also promotes bonding as up to five children can play on the Bongo Drums at any time and each four can work together on the Xylophone. This is great for building team work between classes of children, while they learn to develop their skills and knowledge of instruments, notes and rhythm. Mirror – A fantastic source for inspiration… watch as children pretend play trying on outfits as if they were in a clothes shop. Chalkboard – Can be used during lesson times or if children attempt to draw an image of what is being said in a story. Walk in Store with Chalkboard and Whiteboard – A fantastic storage facility that can hold items for this specific creative zone, plus having a whiteboard and chalkboard mean that teachers can create a chart of who looks after and tidy’s this area. 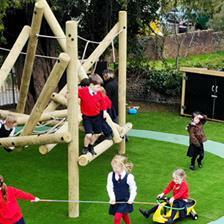 If you are interested in developing your early years outdoor learning environment and want a company you can collaborate with and trust, please do not hesitate to Contact Us or call one of our specialist consultants on the available numbers - 01625 890 330 (North Office) or 0117 379 0899 (Southern Office). If you would like to find out more about our unique approach – Click Here!